Before bringing a Poodle into your family, you should have a good understand their personality traits. Learn more about temperament and personality of Poodles here so you can make an informed decision about bringing one into your home. Poodles are one of the most popular dog breeds in America in both purebred forms and in Poodle mixes or ‘designer dog’ form. 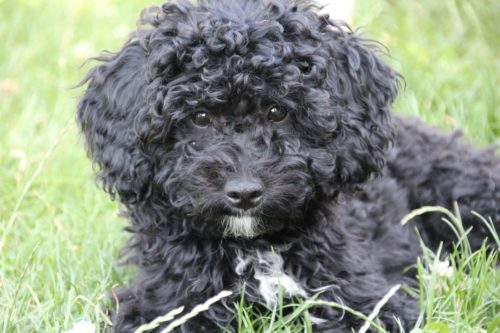 A Poodle mix often crosses with another pure breed to produce a Yorkie Poo, Labradoodle, Goldendoodle, Maltipoo as well as several others breeds. Poodles have been around since the 15th century and appear to have been first bred in Germany. However, the dog breed quickly gained popularity in France and Spain, before ultimately becoming most popular in England. The temperament of Poodles is often described as alert, intelligent, loyal, trainable, active, and instinctual. They are very smart dogs and can learn commands and tricks very quickly. Poodles are known to be quite loyal and typically bond quickly with family members. They tend to be shy around strangers and rarely act in an aggressive manner, apart from some sporadic barking. There are three different sizes of Poodles: Standard Poodle, Miniature Poodle, and Toy Poodle. The temperaments vary slightly among the different sizes. These differences won’t be apparent in every Poodle, but each of the sizes has its own specific characteristics. Standard Poodles are very energetic, but they tend to be slightly more reserved than Miniature and Toy Poodles. Miniature Poodles follow their owners around and are typically the most active of the three. Miniatures are better suited for small children than Toy Poodles since they are slightly larger. Additionally, Miniatures and Toys tend to have slightly more mischievous personalities than Standard Poodles. Toy Poodles are the smallest of the three and make excellent companions. Poodles thrive on positive reinforcement, praise, and physical attention. However, they are very sensitive dogs and should not be spoken to in a mean or aggressive tone. Poodles are quite smart and can easily pick up on the mood of their owners. If you are having a tough day, your Poodle may mimic your mood and end up having a bad day as well. Because of their traditionally noticeable haircuts and distinct canine grooming routine, some people assume that Poodles are fragile, indoor creatures. However, they are actually active, outgoing, friendly dogs who love to run, romp, and play. Furthermore, Poodles were originally used to help hunt waterfowl so they make excellent watchdogs. This breed is alert and curious and will alarm their owners when a person or animal is approaching. Poodles make an excellent choice for families of all sizes and ages and are great breed for first time dog owners. They are true family dogs who can play hard with children all afternoon, then curl up in the living room for an evening of relaxation. The intelligence of Poodles can sometimes result in stubborn dog behaviors. Despite this, they can still make wonderful pets and therapy dogs. Their empathetic personalities and natural ability to engage with people make them great dogs for visiting with people in schools, nursing homes, and hospitals. Since Toy Poodles are smaller, they are able to live in apartments. However, larger Poodle breeds usually require more space and are better suited to live in houses or homes with a yard. 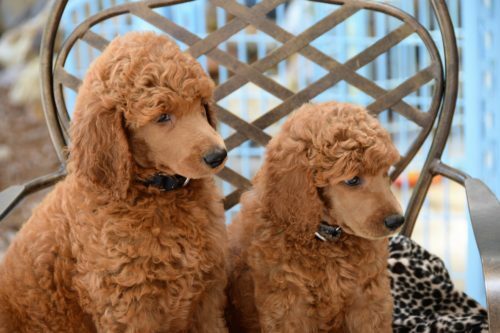 Standard Poodles are large dogs and need lots of room to move both indoors and outside. 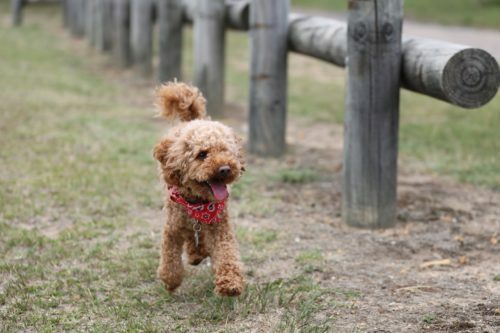 They are typically well-behaved indoors, but unless their owners can commit to exercising their Poodle outdoors on a regular basis, an apartment or condominium will not be the best environment for this breed. Poodles require a lot of attention and want to be around their owners quite a bit. Because of this, they are not typically suited for the elderly or people with very busy schedules. Some breeds of dogs, such as Pugs or Bulldogs, can get by with less physical activity, but a Poodle will typically demand much more of your time and energy. Poodles are also known to get along with other animals in the household, as long as they have been properly socialized with these pets. Since Poodles are very sensitive to noise, they also make great watchdogs who alert their owners if there is a stranger nearby. Most Poodles are extraverts and thrive in large, active, households. They love being the center of attention while performing tricks. This trait can also have its downside, as a Poodle that’s left alone for too long may become neurotic or destructive. Additionally, Poodles like to live in peaceful environments. If your home is chaotic, it can cause your Poodle unnecessary stress. Poodles of all sizes love to play. In fact, it’s vital that they get an adequate amount of exercise every day. Without an outlet to release their energy, a Poodle will become bored and restless and will be more prone to getting into trouble. Poodles are very intelligent and need to use their minds as much as their bodies. Because of this, it’s important to provide your Poodle with lots of activities to keep him busy during the day. When Poodles are not occupied with interesting activities or toys, they may decide to leave a surprise in your shoe or even chew up something else in your home! The temperament of a Poodle usually is very lively and playful. Intelligence games and challenging toys work well for a Poodle’s curious personality. Daily walks and runs can keep your Standard Poodle happy and healthy. Additionally, you may want to consider enrolling your Poodle in agility classes where he will be challenged to use his mind and body at the same time. Although Poodles are very active creatures, the smaller breeds need less space and less daily exercise. Toy and Miniature Poodles make great pets for people with less active lifestyles as long as there are enough toys or activities to keep them occupied indoors. One of the biggest mistakes Standard Poodle owners can make is not exercising them enough. Their reputation for being dainty dogs leads some owners to think their Poodles don’t require a lot of physical activity, but this breed needs to run daily. Poodles that don’t get enough exercise can become anxious or destructive. If you notice that your Poodle is showing destructive behaviors, one of the first actions to take is to give him more of your time. Poodles are highly trainable. They pick up on patterns quickly and don’t require very much motivation or reward beyond treats. They are natural learners making for rewarding canine training sessions for both themselves and their owners. Compared to many other dog breeds, housetraining is typically a breeze for Poodles. Once basic obedience is achieved, a Poodle is ready to graduate to advanced obedience, trick training, or agility courses. Poodles are known for their intelligence and excel naturally in agility competitions. They love to learn and want to please their owners. You can teach your pup to pick up the newspaper and bring you your slippers. They appreciate any opportunity to learn. Standard Poodles tend to be highly instinctual. They display a somewhat excessive tendency to ‘mark their territory’, so it’s important to make sure your dog is house trained as a puppy. The retriever instincts of Poodles also makes them respond to animals they perceive as prey, like birds or squirrels. Obedience training is important for keeping your dog calm when you’re out in the park or woods for a walk. Because they’re so intelligent, Poodles are one of the most alert breeds of dog. This results in them being quick to respond to approaching strangers or anything else within their perceived territory. People-pleasing Poodles are friendly, happy dogs who love to socialize. They are most content when they are the center of attention and have the unique ability to learn behaviors and tricks involving intelligence and agility. Poodles are dignified animals, and as long as they around people they love in a healthy home environment, they will exhibit a cheerful temperament. 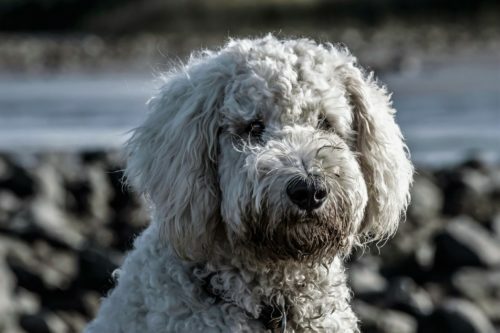 The personality and temperament of your Poodle will ultimately depend on what kind of owner you are, the type of home he lives in, and how much activity your pup gets. When Poodles needs are met, they make great companions. It’s important to understand the basic temperament of any dog breed before making the decision to adopt. This will allow you to make sure your dog’s needs are met and provide him with a happy and healthy life. “ Poodle – Temperament & Personality.” Petwave, 16 July 2015, Accessed 28 Oct. 2017. www.petwave.com/Dogs/Breeds/Poodle/Personality.aspx. “Poodle Dog Breed Information, Pictures, Characteristics & Facts – Dogtime.” Dogtime, Accessed 28 Oct. 2017. www.dogtime.com/dog-breeds/poodle. Cornelius, Sadie. “Poodle Guide: The World’s Second Smartest Breed.” CanineJournal, 14 Mar. 2016, Accessed 28 Oct. 2017. www.caninejournal.com/poodle/. “Poodle Breed Information.” Vetstreet, Accessed 28 Oct. 2017. www.vetstreet.com/dogs/poodle. “Poodle Dog Breed Information and Pictures.” PetGuide, 17 Nov. 2017, Accessed 28 Oct. 2017. www.petguide.com/breeds/dog/poodle. Greenberg, Aurora. “Poodle Dog Breed Information.” American Kennel Club, 6 Nov. 2017, Accessed 28 Oct. 2017. www.akc.org/dog-breeds/poodle-miniature-standard/.